Gathering perspectives to promote global well-being, the Center for Healthy Minds at the University of Wisconsin–Madison will host His Holiness the 14th Dalai Lama Tenzin Gyatso and a panel of experts at a live-streamed event Wednesday, March 9, 2016. The event, “The World We Make,” will take place at 1:30 p.m. Central Time in the Capitol Theater at the Overture Center for the Arts in Madison, Wisconsin, and will be shared internationally through a live stream thanks to a partnership with National Geographic Society and the Mind and Life Institute. The live stream is free and can be viewed during the event. A video recording will also be available to view online after March 9. Learn more and sign up to view the live stream. Members of the panel — moderated by ABC News anchor Dan Harris — will focus on how the world might look in roughly 15 years if today we took seriously the notion that well-being can be learned. For example, mental health costs are estimated to more than double in the United States by 2030 and the speakers, including center founder and UW­–Madison William James and Vilas Professor of Psychology and Psychiatry Richard J. Davidson, will explore how to change that trajectory. Collaborating with Davidson and the center over the past 20 years, His Holiness has shared the concept of “secular ethics” — that all humans, regardless of religion or background, should practice kindness and compassion toward one another — and spurred dialogue among philosophers, politicians, scientists and contemplatives. This vision of a kinder, wiser, more compassionate world aligns with the center’s research mission of cultivating well-being and relieving suffering through a scientific understanding of the mind. 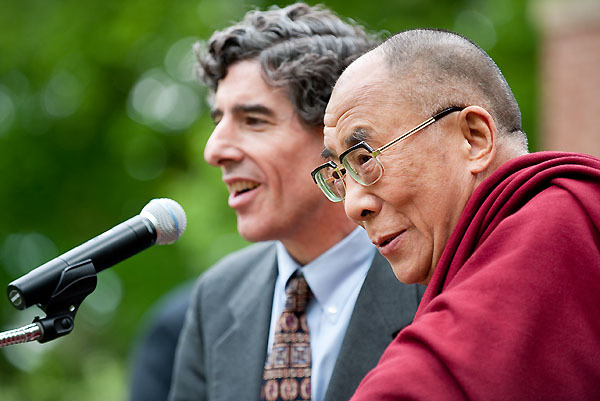 Richard Davidson, founder of the Center for Healthy Minds, who is best known for his groundbreaking work studying emotion and the brain. Sona Dimidjian, associate professor of psychology and neuroscience at the University of Colorado Boulder, whose research addresses the treatment and prevention of depression, with a particular focus on the mental health of women during pregnancy and postpartum. Soma Stout, executive external lead for health improvement for the Institute for Healthcare Improvement and executive lead of 100 Million Healthier Lives, which brings together hundreds of partners across global communities to support 100 million people living healthier lives by 2020. The event is made possible with the support and generosity of event sponsors, including honorary host PwC, partner sponsor Steelcase and ambassador sponsors Chade-Meng Tan, Jeffrey C. Walker and Ready Set Productions. Check the event Web page for updates, the opportunity to sign up for the live stream and the latest information, and follow the conversation on social media channels with the hashtag #MakeTheWorld. Organizations and individuals interested in hosting a watch party can find more information on the center’s website. Event sponsors and center supporters were offered the chance to purchase a limited number of tickets and attend the event in person on a first come, first served basis. Any remaining tickets to the event are listed on the Overture Center for the Arts website, with available seats being displayed by gold circles as stars.